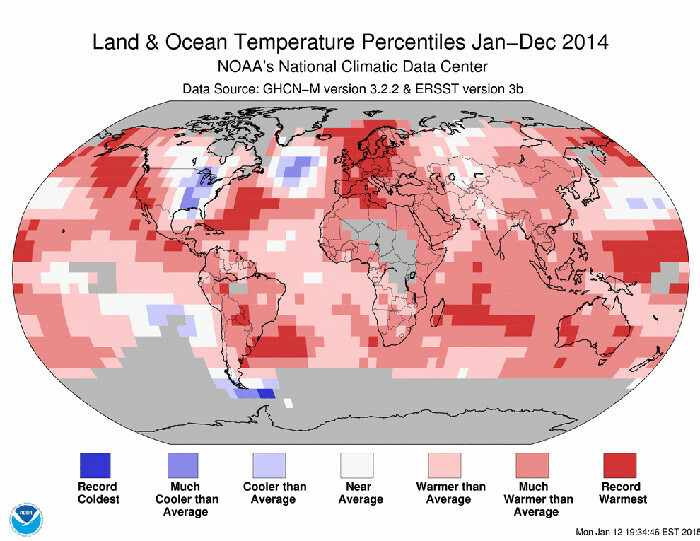 18 April, 2015 - The average temperature across global land and ocean surface temperatures combined for March 2015 was 0.85°C (1.53°F) higher than the 20th century average of 12.7°C (54.9°F). 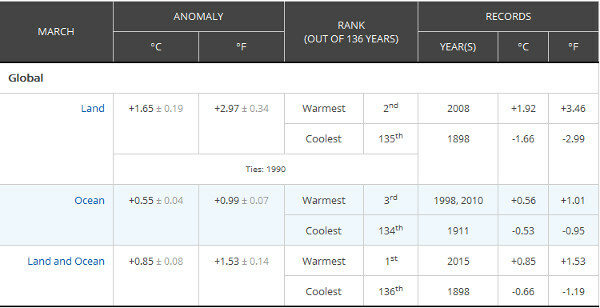 This marks the highest March temperature in the 136-year period of record, surpassing the previous record of 2010 by 0.05°C (0.09°F). 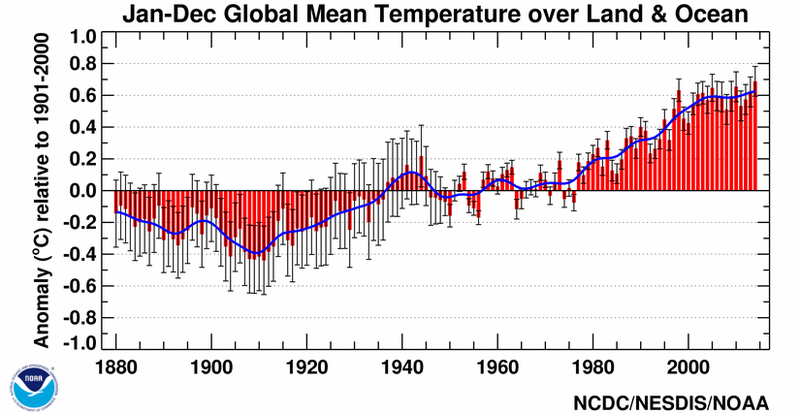 The Northern Hemisphere had its second highest March temperature on record, behind only 2008, while the Southern hemisphere tied with 2002 for third highest. · Australia observed its eighth warmest March since national records began in 1910, due mainly to heat in the north and east of the country. Queensland was the hotspot, with its warmest maximum (anomalies of +2.88°C / +5.18°F), minimum (+1.62°C / +2.91°F), and mean (+1.89°C / +3.40°F) temperatures compared to the 1961–90 average in the 106-year period of record. Victoria and Tasmania were cooler than average for the month, while South Australia and Western Australia were close to average. · It was also a warm March in New Zealand thanks to frequent tropical airflow over the country, according to NIWA, with the national temperature for the month 1.0°C (1.8°F) above the 1981–2010 average. Many sites observed temperatures well above average (at least +1.2°C / +2.2°F). 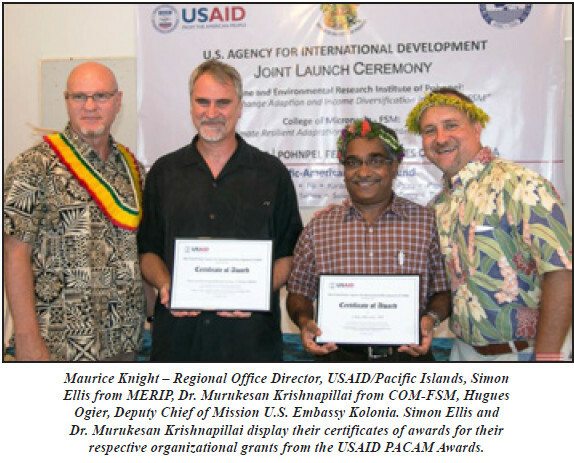 Embassy of the United States of America in Kolonia - April 09, 2015 - The U.S. Agency for International Development's (USAID) Pacific American Climate Fund (PACAM) has awarded grants to two organizations in the Federated States of Micronesia (FSM) to enhance the resilience of the island communities against the impact of climate change and improve their livelihoods. Marine and Environmental Research Institute of Pohnpei (MERIP ) will receive $343,590 for its initiative, Climate Change Adaptation and Income Diversification in Pohnpei, Federated States of Micronesia, to boost the income-earning opportunities for Pohnpei Island's 35,000 inhabitants, and the College of Micronesia - FSM, will receive $556,264 for its Climate Resilient Adoption and Mainstreaming (CREAM) project to educate community members of climate-resilient agricultural methods on the Island of Yap. The carbon dioxide visualization was produced by a computer model called GEOS-5, created by scientists at NASA Goddard Space Flight Center's Global Modeling and Assimilation Office. The visualization is a product of a simulation called a "Nature Run." The Nature Run ingests real data on atmospheric conditions and the emission of greenhouse gases and both natural and man-made particulates. The model is then left to run on its own and simulate the natural behavior of the Earth's atmosphere. This Nature Run simulates January 2006 through December 2006. While Goddard scientists worked with a "beta" version of the Nature Run internally for several years, they released this updated, improved version to the scientific community for the first time in the fall of 2014.